Little Ways to Be You at Your Best, Right Where You AreFrom the can-do entrepreneur Claire Diaz-Ortiz comes The Better Life, a motivational memoir about how little changes make all the difference. 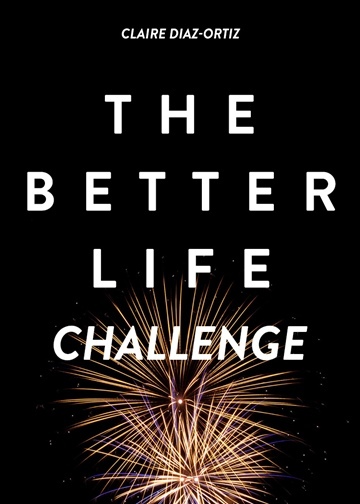 Pulled from that book, The Better Life Challenge offers ten days of wisdom for improving your life little by little. In winsome style, Claire coaches readers with vignettes from her uncommon life. A top-level Twitter employee, world traveler, author, non-profit founder, and mom, Claire tries to make the most of every moment. She shares action steps and reflections on balance, productivity, self-care, and other essentials for rocking it at life every day. Take some advice from Claire: Say yes. Say no. Quit something. Take your mornings seriously. Make your weekends count. Write more. Worry less. Travel. Pray. Pause. Rest. Know your limits. Do Hatchi Patchi. Don't beat yourself up. Be still. Be thankful. Be you, but your best. Start living the better life you've been meaning to. Claire Diaz-Ortiz (@claire) is an author, speaker and Silicon Valley innovator who was an early employee at Twitter. Named one of the 100 Most Creative People in Business by Fast Company, she holds an MBA and other degrees from Stanford and Oxford and has been featured widely in print and broadcast media. She writes a popular business blog at ClaireDiazOrtiz.com and is the author of The Better Life: Small Things You Can Do Right Where You Are. Practical, witty, intelligent, and a well-articulated read, The Better Life wooed me toward the kind of journey I love-a simple, focused, meaningful life. Sometimes we forget that the moments that allow us to feel fully alive aren't found in what we accomplish but who we become. In The Better Life, Claire reminds us that those moments are still possible and inspires us to make them ours, new once again. Claire is a force of nature-brilliant, compassionate, unstoppable. And this book, The Better Life, is her manifesto on living well. I read The Better Life in one sitting-and it made me want to be a better person. Claire's words are wise, transparent, and practical. They breathe hope into souls inundated with information and overloaded with pressure. They offer rest to the weary heart. Highly recommended.